... is a cross-disciplinary fully peer-reviewed journal based in Wales at Bangor University. The journal values intersections between the critical and creative aspects of literary study, creative arts, and media; between the arts and other select disciplines as per issue; and between postgraduate students and alumni in multiple institutions across the UK, Europe and beyond. Hence the name of the journal, 'The Dovetail as a visual construction that indicates an interlocking between creative and critical practice across disciplines. The Dovetail values supporting national and international research within Bangor University, between Bangor University and other universities in the UK, and between Bangor University and participating universities within the European or wider international academic community, in a spirit of good will and cooperation. 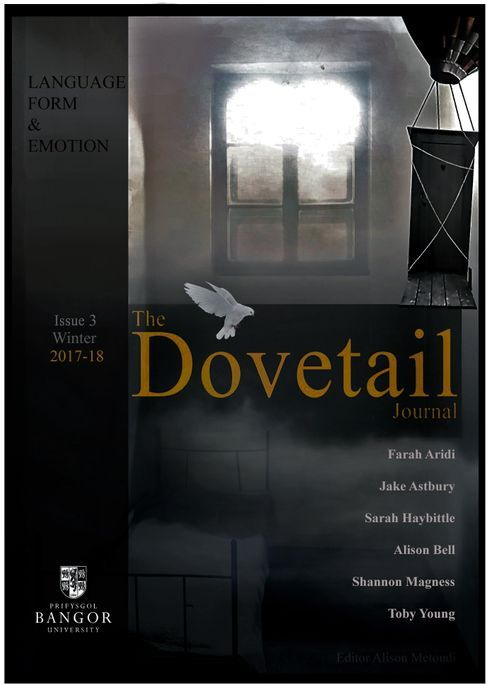 The Dovetail journal aims to represent all periods, genres and approaches to literature, texts in the wider sense, and fields within creative arts, joining critical and creative research related to various subjects or areas of topical and thematic investigation. Support for translation between the Welsh language and English, with regards to our contributors, is provided by experts within Bangor University, where requested or needed. The new edition of the journal aims to expand in scope and reach, to include critical and creative practice research across a range of areas within the creative arts including film, performance based industries and new media. Multiple universities from the UK, Europe and at an international level, are invited to participate and contribute to the exciting cross-disciplinary research at The Dovetail. Currently papers and work are published in response to an annual call for papers only. Submissions are open to postgraduates, postgraduate alumni (MA and above including doctoral or post-doctoral staff). Thank you. To read our basic submission guidelines go here, and in more detail at this page. our guidelines for review go here. © 2018 Dovetail. All Rights Reserved. The Dovetail journal invites creative and critical practice across the arts.